nation's roads, and I'll show you its very soul. engineers in highly-engineered Porsches ply the wide lanes at 200 km/hour. stop dutifully at the red lights and waterbuffalo meander aimlessly and fearlessly. and gracefully step aside exactly 10 nanoseconds before being run over. each one makes up her or his own rules. guiding one billion human beings in their urgency to turn cars into carnage. a disputed Sanskrit text summarizing ten rules of the road. in the same direction. The vehicle in front is allowed any and every movement. Those behind must submit appropriately. will not acknowledge your presence unless you blare, at least a bit. could go through my windscreen)" or "I have not blown my horn for two minutes." Order of Precedence in Article II above. Never stop for an accident, except to pummel victims as outlined in Article I.
yourself, "That's karma," or in the case of a big collision, "That's truckma." compulsory--a large donation to one's favorite temple is optional. drive you mercilessly into the nearest paddy field. twenty-five years and a 40km/hour thoroughfare is never subjected to repairs. have no fewer than 10 hours of college-level Chaos Theory and animal husbandry. process while others ply the safe byways of control. Hilarious article! What a writer! And I agree completely, Indian roads are all as described and sometimes wierder still - the true home for wacky racers. Absolutely hilarious and absolutely true. the general mass in india are completely ignorant and lack one basic ingredient which is needed to be a good citizen - Common Sense. *Good Horn, Good Brakes and Good Luck* was the 1st thing told by the traveler guide to "Albin and Melanie" , hosts of Discovery Channel's TV series '1000 places to see before you die', when they came to New Delhi for their coverage in India and were amazed to see how people cut the traffic and use their horn. Overtaking is permitted in any possible direction and is mostly and always done from the left side. This article is funny but true, atleast about indian roads. Papa, Why they have written HORN OK PLEASE on every truck ? and why it is not written on our car ? this article is true in terms of all details / interpretations. here is another interesting article on driving manners in india. 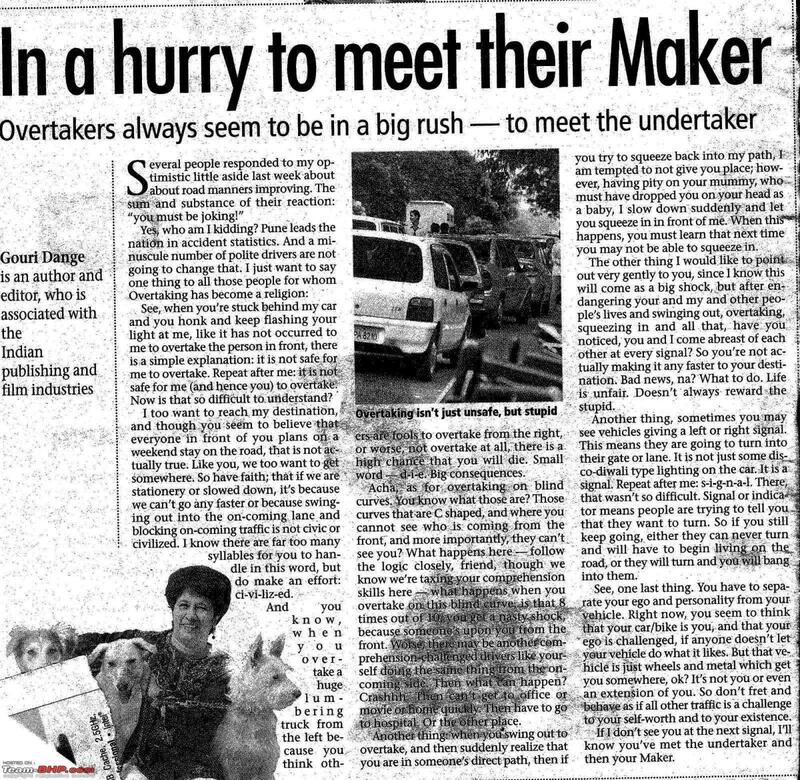 it featured in today's pune mirror (coincidence!!). i scanned it right away after going through this thread and here it is. what can we say? its a fact and we all know and we still read the article. Atleast we should be happy that the percentage of people who respect traffic rules are increasing though this percentage is very less and growing very slowly. @SX4lover: How about posting the link to the article you posted here? can u help me there with a how to do it? this is a scan and not from internet, so i done really know how to put the link. went through the FAQs but couldnt find anything. Please help me as im new here. @SX4lover - I thought you picked it from net. Which newspaper/Magazine is this? Pune Mirror of date. comes with ToI pune edition. Has some really nice editorials by some personality everyday. The author needs to add a point to section IV. 5. While waiting at a traffic light, always assume that the person in front is (a) colour blind (b) incapable of seeing the light (c) loves to linger on for the love of junctions. Therefore you need to horn within 10 milliseconds of the light turning green just to remind him to get on. He also needs to add a full section on how to respect rules. 1. Red lights are mere suggestions. Only diffident fools who need others to guide them in life should follow them. The rest of us are quite capable of judging for ourselves - thank you very much. 2. Those white stripes that run across roads are contest zones for pedestrians vs. vehicles. Giving way means you have lost. 3. Always park right in front of a no-parking sign. The sign means you cannot park on the pavement behind it. 4. It is okay to use the footpath (where it exists) to ride your bike to beat the jam. Those losers in life who cannot afford cars and bikes would do well to make way. 5. Speed limits - the number that you see is the lower speed limit. Under no circumstance should you drive slower. 6. Drive as fast as you can in residential areas and school zones and through villages on a highway. We have a population problem and it needs to be controlled.